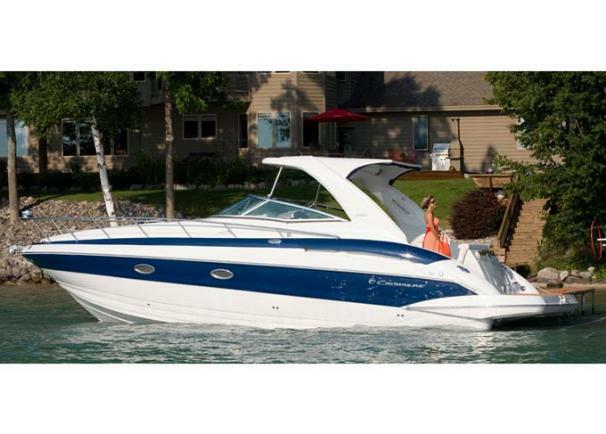 2008 Crownline 340 CR If you are ready to join in the cruiser lifestyle, but don't want to ride around in a square box, this is the boat for you. Standard features include air conditioner/heater, stainless steel refrigerator in the cabin and cockpit, fiberglass hard top with stainless steel grab handles and struts, beautiful hardwood flooring throughout the cabin and aft cabin, stainless steel microwave, teak inlays on the swim platform, DTS - digital throttle & shift control, generator, shore power - and the list goes on and on. The 340 CR has everything you need to create a warm and inviting home away from home on the water. Our boat is better than buying new. We have taken meticulous care of this boat. It is kept in dry storage for 9 months and in the water for 3 months. It was recently serviced and detailed. We have added some practical high quality upgrades.... Two Stern Stainless Rails. For use with marine BBQs and downriggers/crab puller setups. Facilitates getting in/out of boat. SeaBlaze X high intensity LED underwater blue lights-see all kinds of marine life at night and looks great Engine room heater (XTreme 600Watt heathers) for cold weather engine protection. 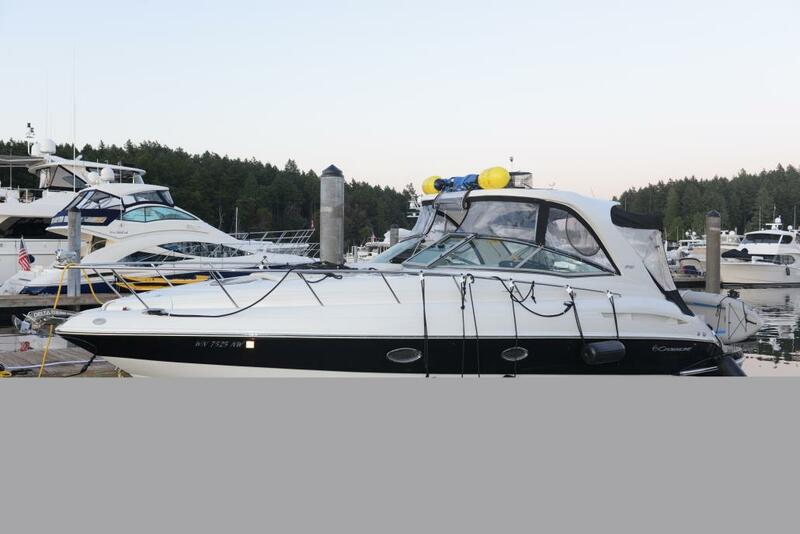 Upgraded high capacity marine batteries and trickle charger Upgraded audio/video system. Pioneer AVH-X7800BT 7" DVD Receiver with Bluetooth New bottom paint in May 2017 Upgraded Mercathodes (PN 88334A2) for improved corrosion protection for outboard drives. 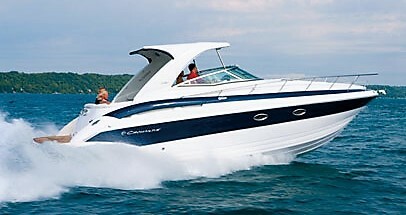 2008 Crownline 340 CR, Always fresh water one owner. This vessel is in Bristol condition. Powered by twin Mercruiser 350MAG-MPI 300 HP Engines with Bravo III drives with 498 hours on them. Other features include: Kohler 5.0 Gen-Set with 1630 hours, D.T.S. Digital Throttle & Shift Control. Built on a solid fiberglass hull, she comes equipped with a fiberglass hardtop and full camper kit. Guests will enjoy the sun on the patio-sized aft cockpit or on the convertible aft bench at the transom. Below, the spacious interior features a convertible settee to starboard, full-service galley with cherry cabinets to port, enclosed head with wall-mounted shower, and a centerline queen berth forward with privacy curtain. A 26' flat- screen TV is built into the aft salon bulkhead, and a large U-shaped lounge in the mid cabin area converts into an adult-size double berth. Topside features include a deluxe cockpit wet bar with refrigerator, standard anchor windlass, and a transom storage locker. The teak inlaid swim platform is a nice touch. 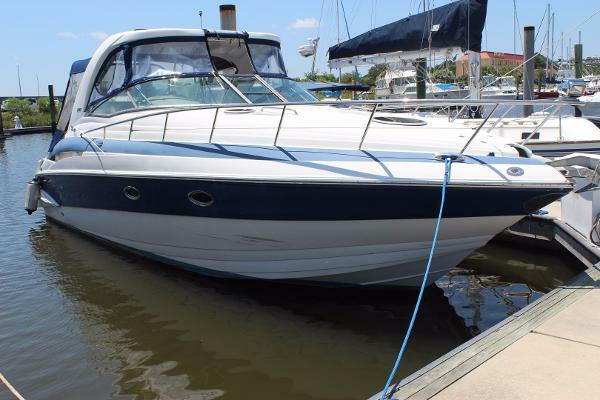 2009 Crownline 340CR This Crownline 34 Express needs some work but is priced at a bargain. The exterior and interior cockpit need to be compounded, waxed and detailed. The eisen glass enclosure needs to be refreshed. Mechanically both engines turn over. A mechanic has concluded that both drives need to be replaced as well manifolds and risers. There is a brand new charger on board ready to be installed. The Generator has not been tested. The air conditioner is not operating as it starts to power up it shuts down immediately. The bilge pumps have been tested and are operational. The seller is willing to make this a great buy for someone as this should be a $100,000 vessel. 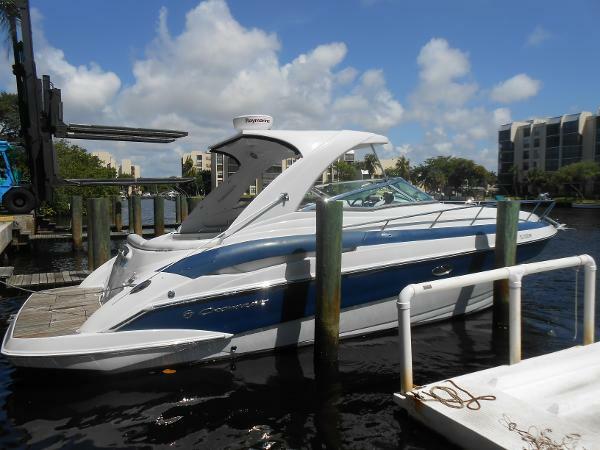 2009 Crownline 340 CR PRICE REDUCED OVER $40K - SELLER SAYS MUST SELL 2009 Crownline 340 Cr, 2009 Crownline 340 CR with 496 MAG MPI Bravo III (750 PHP) engines. One owner (purchased in Feb 2011) with +/- 210 Hrs on engines. Fresh water kept in covered wet slip. Many extras including AXIUS Control, Crownline Convenience Package (Foredeck Sunpad, Cockpit Canvas, Aft Swim Platform Seating and Reverse Docking Lights), Raymarine E80 GPS with Radar and Fresh Water Map Card, Cockpit and Kitchen Filler Cushions and Flit Down Aft Cabin TV w/ DVD. New AC and Hot Water Heater installed in 2013/2014 and new 32" Samsung Smart TV in cabin. Westerbeke 6.5 kW generator. New bottom job and complete service in Feb 2015..
2007 Crownline 340 CR JUST LISTED - INDOOR STOREDONLY 350 HOURS2007 Crown line 340 CR- Excellent Condition . Powered by Larger Twin Mercury 496 Mag. Fresh Water Cooled Motors. 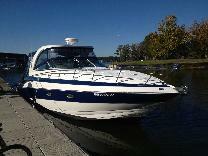 Raymarine GPS, VHF Radio, Lenco Trim Tabs, DTS Throttles, Sea Fire Extinguishing System, Mercury Smart Craft , Electric Windlass , Cockpit Sink & Refrigerator, Teak Swim Platform, Exceptionally Clean Cabin with Full Galley, Stand up Head w\ Vac U Flush, Cabin TV. Much , Much more .